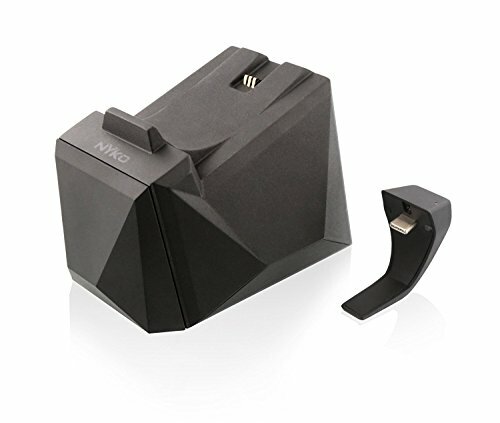 Conveniently store and charge your Xbox One controller with Nyko's Charge Block Solo for Xbox One. The Charge Block Solo comes with a 1,200mAh battery and a replaceable battery cover. This allows for easy drop and charge functionality - no additional cords, wires, or plugs needed. Connect multiple Charge Blocks together from the same or different platform to create your own custom charger. No more low batteries during extended gaming sessions. The low-profile design allows the Charge Block to fit easily in most entertainment centers while the LED charge indicator keeps you notified of the charging status. 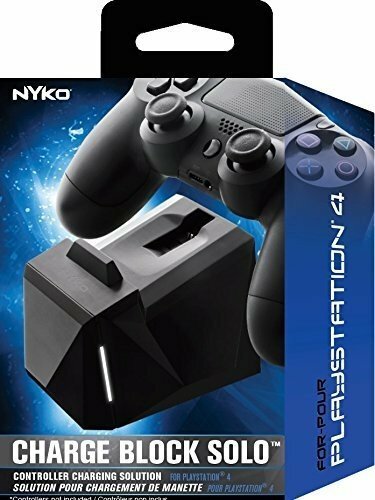 Display and charge up to 4 PlayStation Move controllers with ease with the new Charge Station Quad for Move by Nyko. 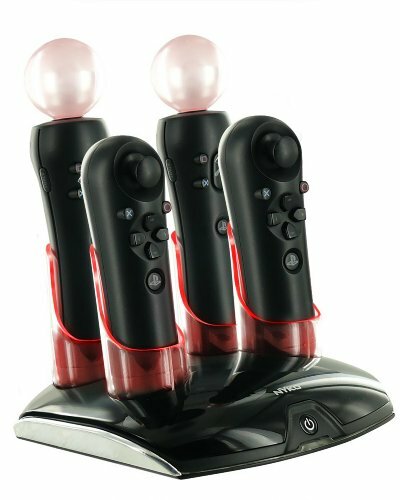 The Charge Station Quad for Move holds 4 Move controllers allowing you to charge the internal batteries of Move Motion Controller or Move Navigation Controller with no additional wires back to the console. 4 separate LED charge indicators inform you of when each controller is done charging with a quick glance. The Charge Station Quad for Move conveniently plugs into any standard wall outlet, providing a faster charge with no need to have messy wires back to the console. 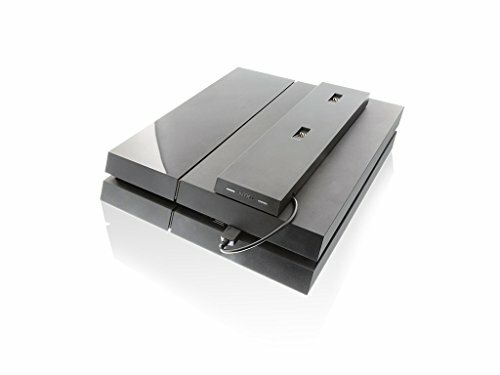 The design and the décor of the Charge Station Quad for Move matches both the Move Controllers and the PlayStation 3 and easily fits in most any home entertainment center. 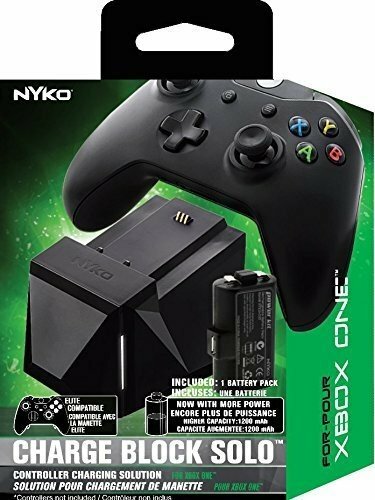 Conveniently store and charge two Xbox One wireless controllers with Nyko's Charge Base for Xbox One. 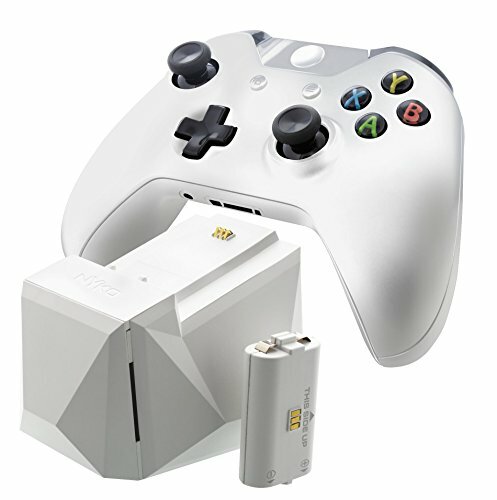 The Charge Base for Xbox One comes with two custom rechargeable battery packs that fit into the controller. 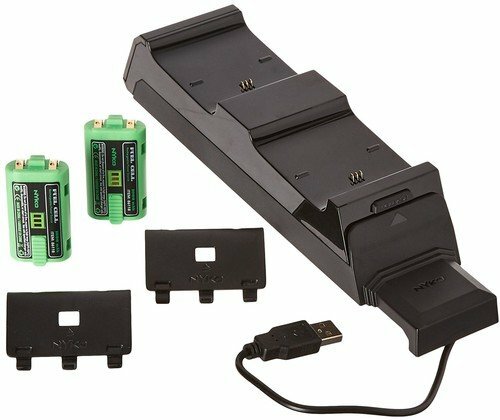 Special battery covers with contact pass-through points allow for easy drop and charge functionality - no additional cords, wires or plugs needed. The battery covers seamlessly sit flush with the back of the controller, leaving the ergonomics and grip of the Xbox One controller unchanged. The dual port recharging dock is AC powered, and plugs into any standard wall outlet, requiring no cables back to the console. The low-profile design allows for the Charge Base to fit easily in entertainment centers, while the LED charge indicators keep you notified of a controller's charging status. *To receive an Elite controller compatible battery cover, please contact customer support here. Please note, the paddles may need to be removed on the Elite controller for it to properly fit on the Charge Base. 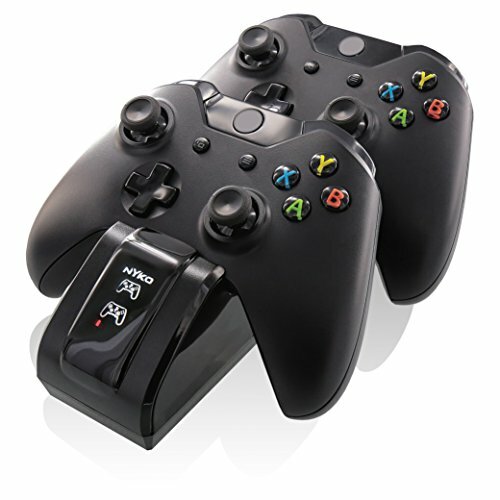 An easier way to charge Xbox One wireless controllers. 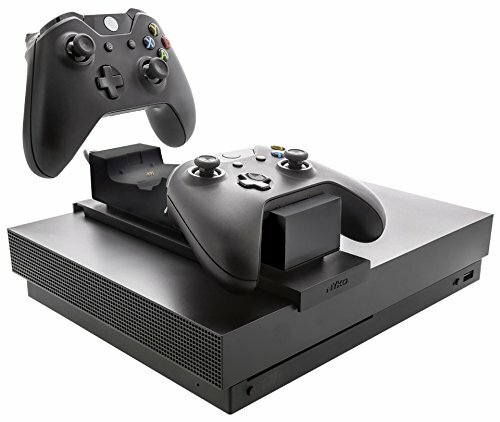 Modular Charge Station EX is designed to be compatible with Xbox One, Xbox One S and Xbox One X. It features two NiMH rechargeable batteries allowing for easy drop and charge functionality. The Modular Charge Station EX is powered by one of the USB ports on the rear of the console and features two pass-through ports on the back. Modular Charge Station attaches to the top of the console, saving space and adapting to the Xbox One console's décor. 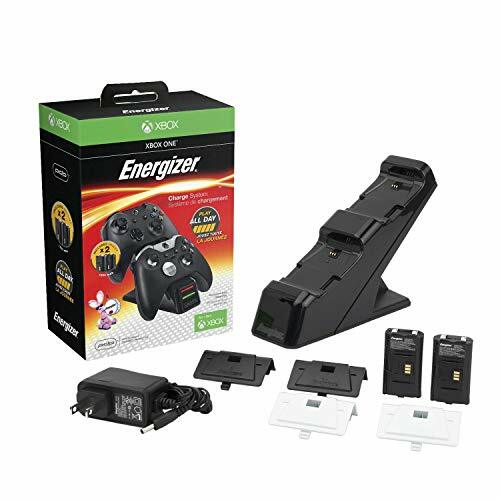 Conveniently charge two wireless Xbox One controllers simultaneously with the Energizer 2X Charging System for Xbox One. 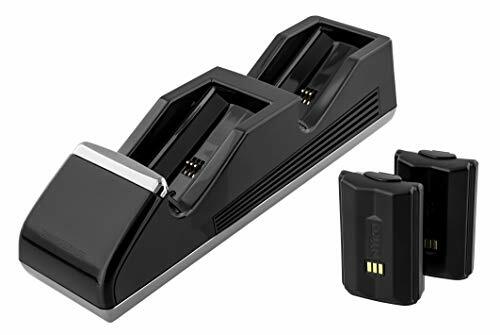 Easily store and secure your Xbox One controllers in the charging system's dual cradles, which are simple to attach and remove, and never waste valuable gaming time again. The glowing LED lights clearly indicate charge status-red when charging and green when fully charged. The Energizer 2X Charging System also includes 2 1200mAh Energizer Rechargeable Battery Packs for up to 40 hours of playtime. Sleek and compact design. 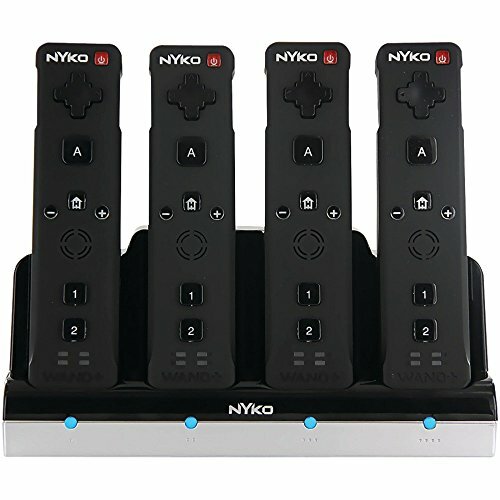 Easily charge and store your Wii Remote controllers with Nyko's Charge Station for Wii and Wii U. 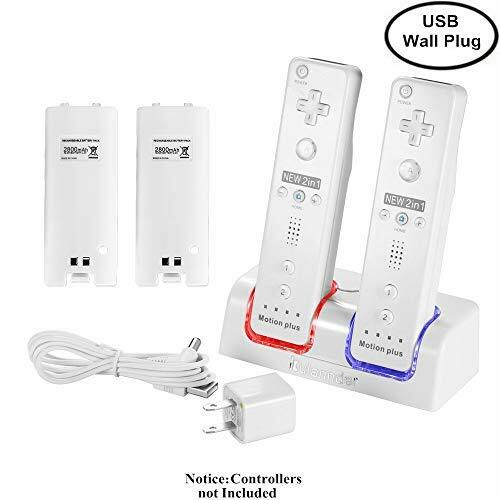 The Charge Station includes 2 NiMH batteries exclusively designed for the Wii Remote, each providing up to 25 hours of playtime power. Each battery pack is easily recharged by placing the Wii Remote in the charging dock. 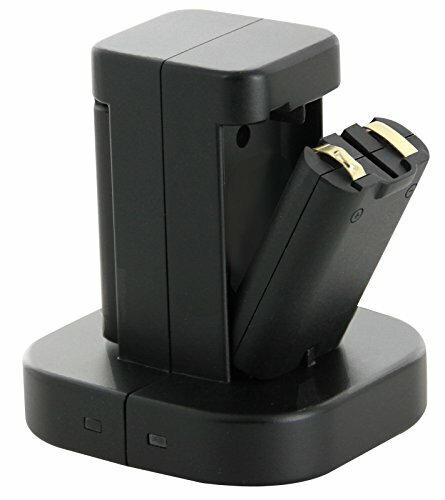 The charging dock conveniently plugs into any standard wall outlet, allowing for rapid recharging of both batteries. The Charge Station also comes with 2 custom battery covers with contact pass-through points so you can charge the batteries while they are still in the Wii Remote. Each battery cover is also rubberized for superior grip during intense gaming sessions. The Charge Station matches the décor and styling of the Wii, and is small enough to fit in any home entertainment center. 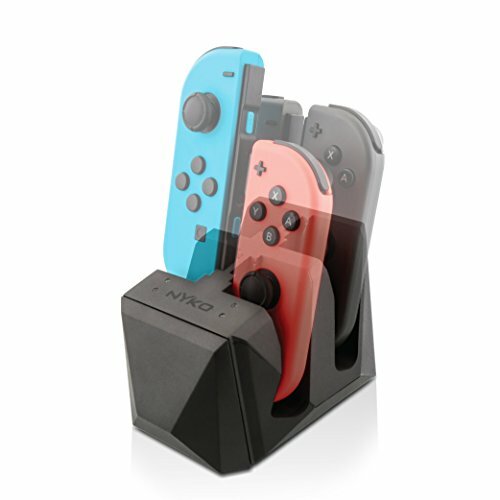 Conveniently store and charge the Nintendo Switch and two Joy-Cons with Charge Base from Nyko. 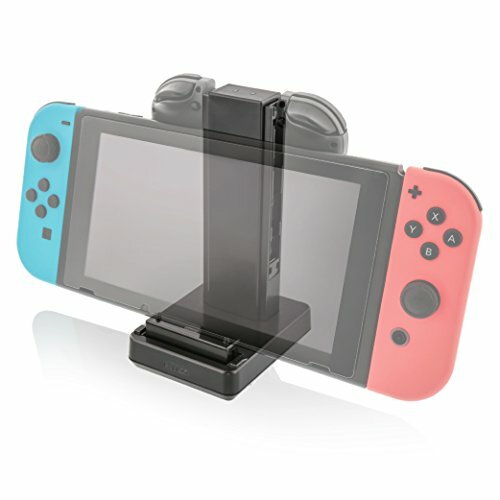 Charge Base is the ideal way to charge the Nintendo Switch while you are away from your main dock. Featuring a charge and play design, Charge Base acts as a stand and charges the console at the same time. Perfect for long gaming sessions in tabletop mode. Charge Base plugs into any wall outlet and is perfect for as a secondary charging dock. A 2X conductive charger for the Xbox One with an AC Adapter Power Adapter for quick charging. Features blue and green LED indicators for charge status. Has matte and glossy black and chrome details. This sleek design matches the new console perfectly! Includes 2 1200mAh Energizer Recharge Battery Packs for up to 40 hours of playtime. 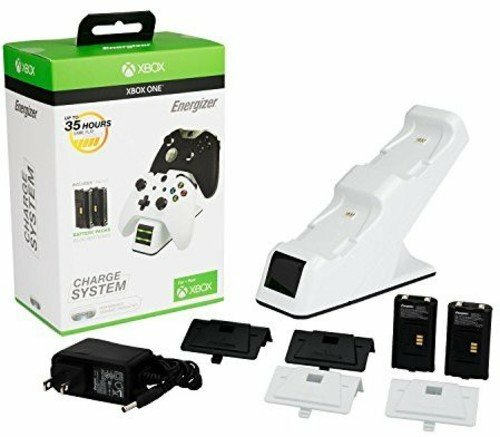 Conveniently store and secure your Xbox One controllers in the charging system's dual cradles and never waste valuable gaming time again. 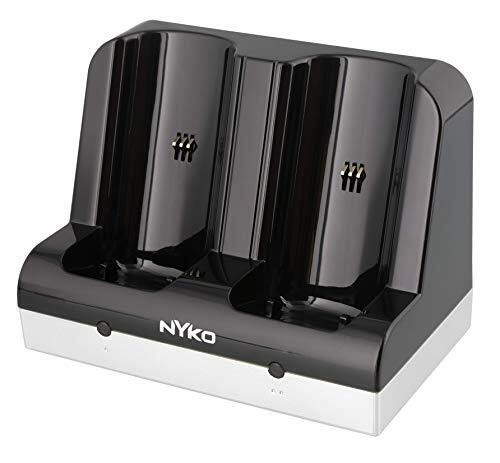 Conveniently store and charge two DUALSHOCK 3 wireless controllers with Nyko's Charge Base for PlayStation 3. The Charge Base for PlayStation 3 comes with 2 custom USB charge adapters that attach to the Mini USB port on the controller, leaving the ergonomics and grip of the PS3 controller unchanged. The patented adapters allow for easy drop and charge functionality - no additional cords, wires or plugs needed. 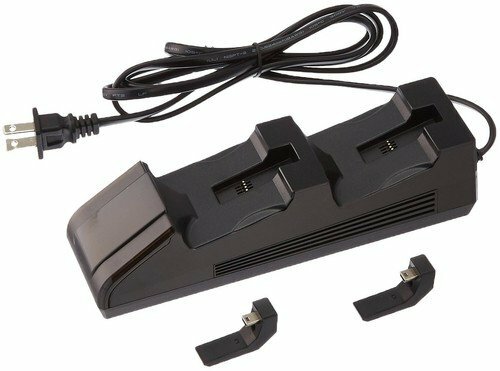 The dual port recharging dock is AC powered and plugs into any standard wall outlet, requiring no cables back to the console. The low-profile design allows for the Charge Base to fit easily in entertainment centers while the LED charge indicators keep you notified of the charging status.